Not everybody wants bling on their fight gear. For the more modest and clean look, the Revgear Spartans are perfect. A two-way stretch body and a 4-way stretch crotch gusset provide a lightweight breathability that can also handle the rigors of intense training. The shorts are made from an antimicrobial/water-repellent fabric, featuring the Brazilian and American flags as backdrops to the Revgear logos. Reinforced split seams on the side of the shorts offer excellent mobility and leg movement. Waistband is adjusted by drawstring and secured with a hook-and-loop closure. 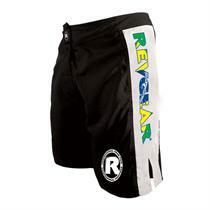 Email your friend about the Revgear Spartan Pro High Performance Fight Shorts. Ask a question about the Revgear Spartan Pro High Performance Fight Shorts.